There is a large body of research evaluating current building energy simulation tools, finding that the linear vapor transfer methods often miscalculate the effects of moisture in thermal transfer. In response, this research utilizes physical experiments conducted within a fully automated, custom hotbox setup, designed and built by the author. Industry-standard guidelines for hotbox setups, such as ASTM C1363-11 (ASTM International 2011) in the United States and EN ISO 8990 in Europe, are designed to create uniformity of material data. The standards outline procedures to calculate thermal resistance using the amount of power required to maintain steady-state conditions in each chamber. 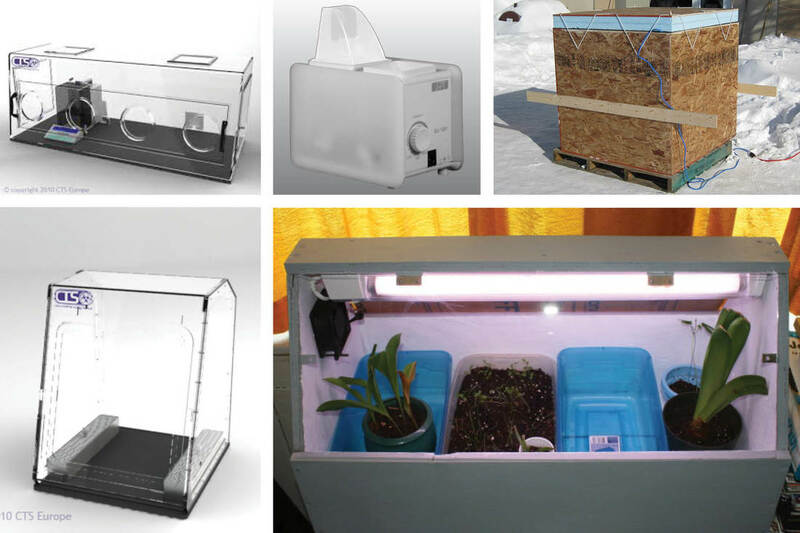 However, the apparatus used in this work utilizes readings from ambient temperature and relative humidity conditions instead to determine relative hygrothermal performance. Findings are compared against each other instead of against specific numeric metrics. Since the intention of the experiments in this research is to identify phenomena, not to quantify specific heat and mass transfer values, the standards are referenced for guidance but do not strictly govern the work. An interchangeable material specimen is sandwiched between a conditioned (hot-humid) and unconditioned chamber. Each box encloses 1 ft3 (.028m3) of clear volume with Onset HOBO sensors measuring ambient temperature, relative humidity, and surface temperature. Unlike commercial hotboxes, only one chamber is controlled to achieve steady-state conditions. This chamber, the ‘exterior’ chamber, simulates the hot-humid conditions commonly found in tropical climates. The unconditioned chamber represents the interior of an unconditioned building without accommodations for natural ventilation. When properly pre-conditioned, the exterior chamber operates within 1°C and 3% RH of set conditions. Though it does not meet the accuracy demands of the larger chambers described in ASTM or ISO standards, the table-top chamber has a number of advantages, most notably including cost. Large-scale commercial hotboxes can cost upwards of one million dollars to construct and maintain. As a result, it will cost an architect several thousands of dollars and several weeks of time to send a sample in for testing. Given the time commitment and exorbitant cost, most designers are not able to implement this type of analysis into their design process. The apparatus used in this research was instead constructed for under $1000, of which $627 was for the HOBO sensors, which could be constructed more affordably with only a little more effort. Additionally, the small setup is operable by one person, is demountable and is easily stored when not in use. Building professionals have been testing facades for years, although it is not often done at this scale. Above are a few examples of artificial environments used commercially. 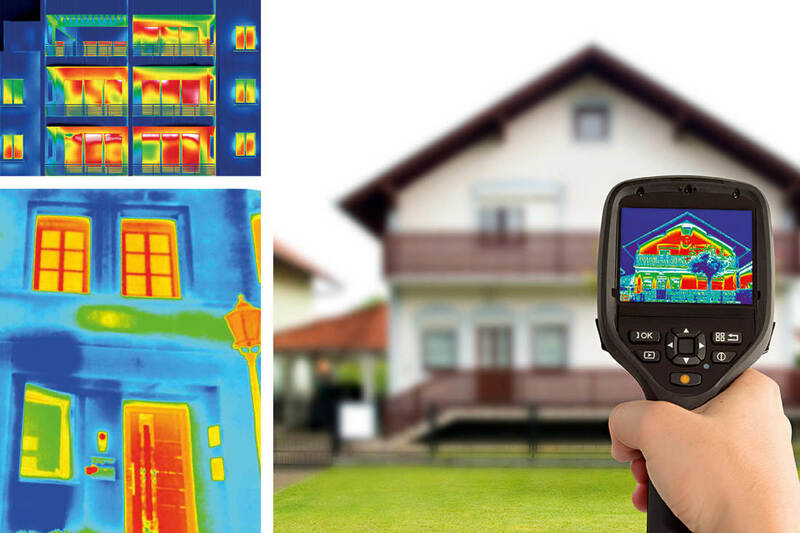 Thermal scanning is a common way for building professionals to clearly see where temperature differentials exist. I'd love to somehow integrate this technology into the project. ​ASTM International. 2011. ASTM C1363-11 Standard Test Method for Thermal Performance of Building Materials and Envelope Assemblies by Means of a Hot Box Apparatus. West Conshohocken, PA. https://doi.org/10.1520/C1363-11.